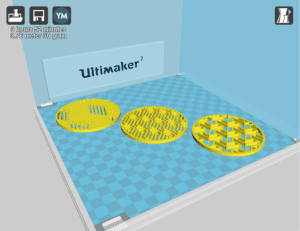 Cura is a free slicing software that is created by Ultimaker. Cura has a lot of features, and these are definitely for the advanced user. If you’re serious about doing your own slicing and want to do advanced things that go beyond predefined basic slicing settings, then the Cura slicing software is definitely a good slicer to try out. Hey there, everyone. This is Tom on the WTFFF 3D Printing podcast. Today, I’m going to be doing a review of the slicing software called Cura. This is going to be a more technical episode than some that we do because slicing software, especially this one, just gets inherently technical. Just want to preface this episode with that understanding. Hopefully those of you that have a real interest in slicing software, and we got a lot of comments on our Slic3r software review last month. I know that there many of you that are interested in continuing to hear slicing software reviews and other software reviews. We’re continuing to do that on a regular basis. This is the latest one. 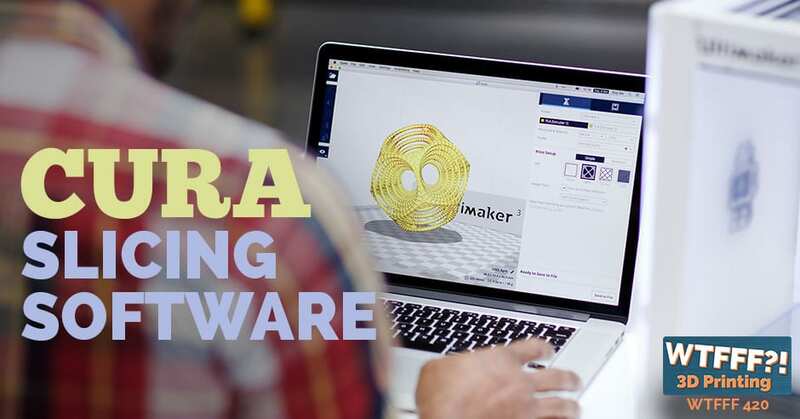 Cura is the slicing software that Ultimaker makes specifically for their 3D printers. Before I get into heavy technical details, I just do want to talk about the Cura slicing software and where it came from and what it’s all about. Cura is a software that is created by Ultimaker. Ultimaker is a European manufacturer of 3D printers. This is the slicing software they make specifically for their 3D printers. It’s also something that make freely distributable. Anybody can go and download it off of their website for free. There was a lot of documentation on it. There are some tutorial videos. They have resources. They have a community and knowledge base and a place where you can go up there and post a question if you’re having an issue and get help from other users. I find that’s very useful. 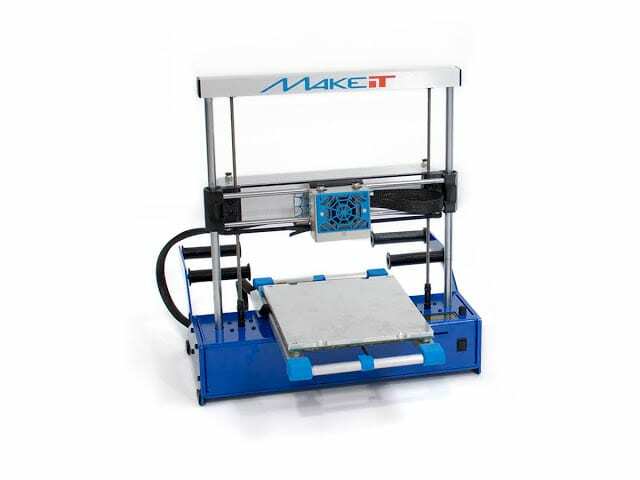 As a company, I think Ultimaker is a pretty comprehensive company that is very experienced. They’ve been around for quite a while. Cura has been downloaded, they claim, more than one and a half million times. They have a community of members involved in the knowledge base of almost 26,000. They’re based in the Netherlands, in Europe. For those of you who may be very new to the desktop 3D printing scene, really the Europeans were pretty advanced and I think ahead of the US in many ways. In desktop 3D printing, in adopting it, and then companies that are created in that industry. Certainly there was the RepRap movement early on and a lot of development in especially Brooklyn, New York and other areas in the United States, but the Europeans really jumped ahead. Ultimaker is one of those early companies. They certainly make a very nice 3D printer. We’re not really going to talk about that today. We’re really just talking about their Cura slicing software. 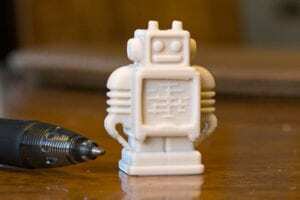 Robot model originated by Ultimaker. If you’ve ever seen the little robot model at trade shows or online that companies use to print, to show that the quality of the printer can do, that robot model originated with Ultimaker. In fact, it’s a part of their company identity and their logo. They’re a very open company and their software is available to anybody. You can download for free. That’s also true of some of their models, and that little robot is one of them. A couple years ago, when I purchased my first 3D printer that was a more open sourced 3D printer, that was an Airwolf 3D printer. While that’s a pretty expensive printer, it actually had a lot of capability that I was looking for. That company, Airwolf 3D, happens to be located very close to me in Costa Mesa, California. It’s maybe ten miles away. I actually went in to their office and paid for some training on their printer. They actually, at that time, were saying to use their printer you need to download Repertier, which is another program really more about controlling your 3D printer, and then the slicer being Cura. They, in their offices, just on my laptop, had me go out to Ultimaker.com and download Cura and start to use it. Although Cura didn’t have a profile predetermined for the Airwolf printer, I think it was HD2x printer at the time that I was using, certainly Airwolf 3D had all of the settings and things that I had to enter in manually to configure Cura to work with my printer. Cura certainly does have profiles for all of their own printers and what they consider to be the most popular 3D printers that are out there on the market. But of course, you can have another printer and you can enter in your limitations or your build volume and all the key criteria of your particular printer in manually. Cura will work and communicate with I think just about any 3D printer out there. As long as it’s not a completely closed system. If it’s more of a closed system 3D printer it probably won’t work with it. I had some experience using the Cura slicing software back a couple years ago. I eventually did sell that Airwolf 3D printer because it really didn’t achieve the kind of quality that I wanted for the models that I was making and printing at the time. I ended up selling. Or I think I might have returned that one within a couple months, because I had a 60 day window. Either that or I resold it to somebody else and moved on to other 3D printers. That is beside the point. Cura is the point here. I was using Cura for single extrusion and dual extrusion. That’s something that I’ve been working a lot with and waning to achieve more and more over time, is dual extrusion. Cura certainly does support that. The Cura software has what I would call their recommended settings. You don’t have to use it in any kind of expert mode. If you want to use Cura, you just load your STL file. Obviously you have to configure it for your printer. Then you can choose some basic settings for the quality you want to achieve and pretty easily slice a file and either connect with your printer to print it or you can save that G code file and load it to your printer manually. Whatever you want. In that sense, it works pretty easily and it’s got lots of great options for manipulating your model once it’s loaded into the program. They’ve got very intuitive tools that you see in a lot of different slicing software that are out there. 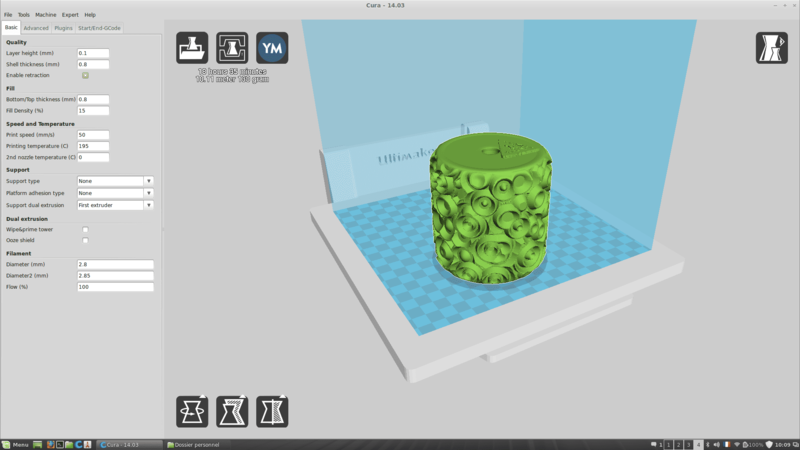 Cura Slicing Software: You can define anything about the settings of a print you want to do. You have full control. What I really want to dig into a bit is some of the advanced options within the Cura slicing software. There’s a lot of things that I think Cura does very well and I’m impressed with. I did, even though I don’t generally use Cura all the time as my slicing software, for my more open 3D printers and 3D printer testing and things like that, I certainly have used it quite a bit in the past. I downloaded the latest version to experience it for myself in preparation for this review. They’ve changed some of the user interface since I last used it and had to get used to that. But really, it’s pretty easy to understand. You can define anything really about the settings of a print you want to do. You have full control. When you go from some of the recommended pre setup settings to the more custom settings, the more expert details, expert modes and settings that you can do, this is one of those slicing software where you can do pretty much anything you want to. Including make mistakes. You can tell it to do things that it really shouldn’t do, as if you want to experiment and learn. Or as you’re trying to achieve certain things, you’re going to go through a lot of trial and error. Just be aware of that if you’re going to start working with this slicing software or others like it. This is not unique to Cura. There are certainly lots of others. We’re going to go over some of those others later. We’re going to cover Simplify3D in the future, as well as a few others that we’ve come across recently. Every program has some different particular features and traits about it. 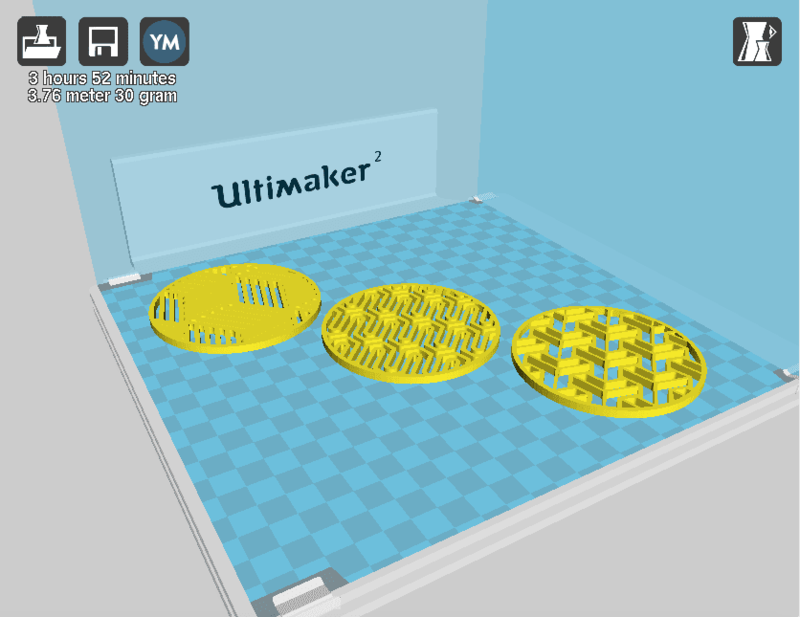 With Ultimaker, one of the things that I really like is that they’ve made the program pretty open and they have a lot of plugins that are available for you to use in terms of manipulating your model differently. It used to be the interface for those plugins was in one particular place. Now, it’s located under special modes and then their preferences. There’s a lot of different plugins that you can use there. Too many to really talk about here. The point is, this is a program that is not just limited by what Cura is doing. There are other companies that are creating plugins that are available in order to enhance the process and give it more capability. One of the plugins that I really have been incredibly fond of is actually now located under extensions menu and post processing sub menu and then it say modify G code. This plugin I’m going to talk about is considered a post processing plugin. You would do all your normal slicing settings in the main interface and then you have to go to extensions and get through to these post processing scripts if you will. This one I want to talk about is called Tweak At Z. Tweak At Z, I find it really an indispensable plug in or feature of this program. Because what I’ve often found is, with a lot of my models, when I slice them, not all of the slicing settings and behaviors are appropriate for every portion of my design, of my model that I’m trying to print. For instance, in the very beginning, several layers, not just the first layer, I want to slow it down and really make sure not only does it stick to the build plate, which obviously there are settings so the first layer can go slow and then everything else. But even the first several layers, I like slowing it down to make sure we’ve got a really solid foundation before speeding things up. Or let’s say you have an area of a model that’s really pretty plain and simple, for a while it’s just a straight cylinder straight up. You can speed it up through that area. Then you get into an area of more detail. Maybe it’s threads, you’re 3D printing a bolt. Or maybe it’s just a lot more smaller fine areas that then there’s a lot more detail in. Maybe there’s texture in certain areas and it’s flat in other areas. Just as you approach those areas of more detail, you want to slow it down. You want to change your flow rate. Maybe you want to change the extruder temperature in those areas, because that also might help your flow rate. 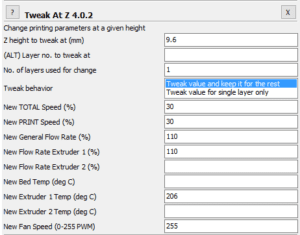 This Tweak At Z, of course Z representing your Z axis moving up through the model, you can say at a certain height, after five millimeters or after 25 millimeters, whatever it ends up being that you want to do, you can change the behavior, change the settings and for how many layers above that. There are lots of different ways to do this. You’re essentially adding another layer of information to the main G code that gives you greater control over your print. 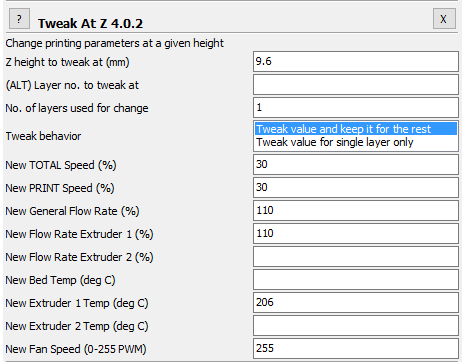 As I was using the Cura slicing software, I found this one of the most valuable aspects for the things that I print. Because there was a lot of variation in geometry at different heights throughout the prints. I wasn’t slicing anything without it. If you’re using Cura and you’re not aware of it, you definitely want to check that out. 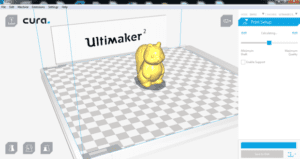 If you’re new to Cura and you’re considering using it, make sure you dig into all the details and maybe go on to the forums at Ultimaker.com for Cura. Check out what other people are talking about with these different features. With Cura slicing software, you can add as many extruders to the profile for your printer when you set up the printer. Again, I want to emphasize, these features and details are not really for the new user. It’s definitely for the advanced user. If you’re new and you’re getting into it and you’re exploring these things, you’re going to get confused really quick. It’s a good education and I recommend doing it if you’re serious about doing your own slicing and trying to do some advanced things that go beyond just what the standard predefined basic slicing settings are with any slicing software really. You got to get into the details. Especially when you’re looking at things like dual extrusion if you have a printer that is going to use one color for your model and another for support or you’re going to try to actually do a two color printer or a multiple color print. There’s the thing about Cura, you can add as many extruders to the profile for your printer when you set up the printer as you need to. We have an interview coming up here within the next few weeks with Brandon Davis of Blue Dragon. That’s a relatively new company. We’ve talked about them a couple times before. We’ve had Brandon on as a guest before on WTFFF. He informed us, I know because I conducted the latest interview already even though it’s not going to come out for a couple weeks, that their new printer at Blue Dragon which feeds four different filaments. I believe it’s limited to four. Four different colors or materials of filaments into a single nozzle. They have tried every slicing program and they’ve come back to Cura being a really good one that works well with their 3D printer. Even a more modern 3D printer that has a single nozzle but multiple filaments feeding into it can be used with Cura. It treats them like separate nozzles even though there’s no offset of one nozzle to another in distance. 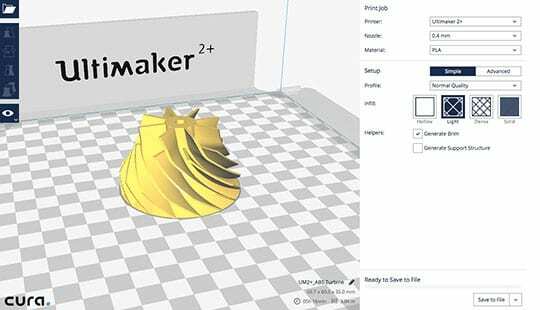 If you had actually two nozzles that are 20 or 30 millimeters apart, that’s information you put into your profile setting in the Cura slicing software to let the printer know where the other nozzle is. It also reduces the effect of build volume of the printer because you can’t get both nozzles at the same position around the perimeter of your build volume. Because obviously usually on the two extreme right and left sides, you can only get one nozzle or the other, depending on which side you’re on. In the case of these printers, and many more are coming out that have one nozzle and multiple filaments feeding into them, it can still work with them. When it comes to dual extrusion, I’ve done a lot of experimenting with that. If you go back and look at some of the reviews that we did, like of Builder Dual 3D Printer in particular, that was the first 3D printer we reviewed that had two filaments feeding into one nozzle. I used the Cura slicing software as well as other slicing software to experiment with dual extrusion and to try to get a two color printer to work accurately. Cura uses what they call a prime tower. We’ve mentioned this a couple times in the past on other episodes in other contexts. When you have especially multiple or two at least filaments feeding into one nozzle, when you need to change color from one to the other, when it stops printing the good portion of the part in that color and you want to switch to another color, there’s still molten plastic in the chamber of the nozzle of that first color. In order to start printing the next color, you’ve got to squeeze out, you’ve got to extrude out the rest of that filament and get to the next color. Where are you going to put it? What are going to do with it? 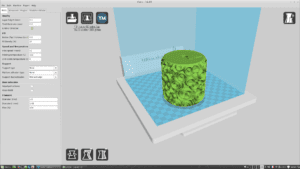 Cura Slicing Software uses a prime tower. When it’s going to change colors, it moves off the part somewhere to a back corner then creates a little tower. There’s a lot of advanced work being done with certain companies and certain 3D printers. Some of them are trying to really just squeeze out that extra material in the infill of an object you’re printing if there’s enough open space in the infill to do it. Not every model you print is going to have that capability and have that open space to be able to deposit excess material. Many programs have some form of a prime tower. When it’s going to change colors, it moves off the part somewhere to usually a back corner of the build plate. Then creates a little square or rectangular tower. Certain programs give you control over the size of that tower and how big you want it to be. It’s just a place where it’s going to go and squeeze out. Let’s say you’re printing white and blue. You’re using white first. When it’s going to change to blue, it’s going to go out to that corner and squeeze out the rest of the white until it gets to the blue. Then it’s going to come over back to your part and start printing the blue. It’s going to keep doing that, switching back and forth all the time, every layer that contains more than one color. It really increases dramatically your print time to do a dual extrusion print when you have to not only be printing different sections, but also you’ve got to go and purge. Depending on how much excess space there is in your nozzle, in your chamber, that could be a lot of material you have to squeeze out. I found that I had issues with the software, with the Cura slicing software, and honestly others as well that I’ve tried. It’s been quite a while, but I also did some new testing in preparation for this interview. I found dual extrusion is great in theory. The machines, usually the hardware are very capable. But the software still needs some work. 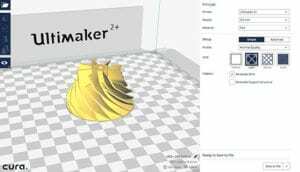 I think there are estimates being made, and it depends from printer to printer, especially if Ultimaker doesn’t have in the Cura slicing software a predetermined settings for your particular printer. They make some estimations and assumptions of maybe what big a volume that the nozzle chamber is that’s going to squeeze out the prime tower. It’s not always accurate. I continue to find that I get colors printing in the wrong areas from where I want to, even with this program. There are ways to overcome that. Like I said, with the size of a prime tower. I forget what other programs call it. There are things you can do to try to govern that and change that in all the other detailed settings. Again, this is advanced technical 3D printing, using a program like this. You are going to modify your shell thickness of your print, your infill. You’re going to modify your speed, your cooling fans, even something as that. This is advanced stuff. I don’t know how many of you listening are makers to that level, where you’re really getting into all the technical detail. As you’re slicing out a part for your printer, you want to get into the detail of when is my cooling fan going to turn, when do I need it, when do I not. If you’re new to 3D printing, this is a really complex thing. You may not want to get into it. 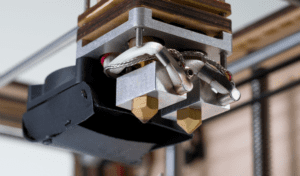 If you’re a highly technical person and you’re doing advanced 3D printing and you’ve got quite a bit of experience, you know that, “Gee, this plastic seems like it’s not cooling quickly enough in a certain area. I got to make sure I change my cooling fan settings. I’m going to have it printing faster and at certain times and then I’m going to stop it so it doesn’t print at other times.” There’s a lot of details to get into. The good part and the positive aspect of a program like Cura is you have complete control. You can do anything you want to. I would highly recommend, if this is your gig or something you want to get into in terms of using an advanced slicing software, go and download it and download the manual for it. You will find, they have a good manual that has very high level of detail of all the different features and what each of them does and why you might want to use them or not. I would go through and even at the recommended settings, go in and look at what all those settings are. When you’re going to use a program like this, you want to know what the baseline is, what the recommended settings are. Then after, you’re going to go and change certain settings because you think that’s going to be what’s going to achieve your goal. Cura Slicing Software: When you want to make a change to see if it improves it, isolate and only do one thing at a time and then see how it works. Another thing that I’m going to recommend is when you do that, you change one thing at a time and you do a lot of little prints. I’ve just done this recently in testing a 3D printer that we’re going to publish a review on here very shortly. I’ve done well over a hundred prints on that printer because I was testing out different things. Every time that I want to make a change to see if it improves it, I want to isolate and only do one thing at a time and then see how it works. That means a lot of printing, a lot of time spent. But if you’re going to really want to achieve good results, it may take that. My recommendation if you’re going to do that is that you get out an Excel spreadsheet on your computer and log all the different settings that you are going to play with and change and note what they all are and give each print a unique file name for the G code. Then note the changes and log every different print that you do, what you did, so that you can also have a field where put the results. “This worked better, this didn’t work as well.” You can go back through it at any point. Because at some point, you’re settings are going to get off the rails and you’re going to produce a big stringy mess. You’re like, “I need to step backwards to the last things that worked.” You want to know what those will be. Documentation is really key in doing that. I know even big companies, like another 3D printer that I bought at one point was a Leapfrog, another dual extrusion printer at some other company out of the Netherlands. I ended up reselling that one as well because after six months of working with it, it really wasn’t meeting my needs, doing what I wanted it to. How did I figure that out? I was documenting every single print. I took it a step further. I went beyond Excel. I know that Leapfrog, even when they’re testing, their technical people told me they use Excel to log all the changes when they do it too. Create a good spreadsheet, get all the data captured. I actually created a database in FileMaker Pro so that I had a more friendly user interface. I could also upload a photo of every print with every record of every different print that I did. I’d not only had a written reference but a visual reference. I found that incredibly useful. I know that departs a little bit from this particular software because this is something that I would recommend for any advanced or highly manual expert level settings that you’re going to do in any slicing software, is that you really document very well all the changes that you’re making so that you don’t forget. Maybe some of you have such a great memory, you’re really going to remember a lot of this stuff, but I don’t. I’m a list maker. I have to write down everything and make notes so I can go back and use that as a reference and find out what worked and what didn’t. Especially so I can, in the future when I have a model that has similar characteristics, I can go back and say, “I printed this other model back a month ago that had similar qualities. Let me go see what settings I used there.” I can go back and see what those settings were and start from there. It’s a lot of time spent up front but I think that it really will help you a great deal in the future when you approach new models. Start with certain base settings and then make incremental changes from there. If you’re finding this suggestion, recommendation useful, I’m going to recommend you go back and look at an earlier episode where we were talking with Russell Singer, he works at MAKEiT. Because he’s a technician that works at this 3D printer company called MAKEiT in Pasadena. At one point, we talked with him about how he approaches attacking a difficult 3D print. He talked about, he starts with generally I think it was higher temperatures rather than lower. He gave a bunch of suggestions of the settings that are most likely to work starting out. If that works, then changing and tweaking them incrementally from there. You might go check out that episode. As I went through and reviewed and reinstalled and used the Cura slicing software, the latest version, which on Windows is I think 2.3.1, freely downloadable. I really found that it’s been improving. It continues to get better. This is a solid slicing program. Nothing wrong with it. If you’re using more an open sourced 3D printer or even one that’s not completely open sourced but that still allows you to create a G code and send it to it to do advanced settings, this is a great program to consider. I do actually recommend it. It’s not my ultimate favorite. We’ll get to what that is in a future slicing software review coming up here in a couple weeks. But certainly very competent, very good. A lot of people love this software and it’s their standard. I have no reason to dispute that or steer anyone away from it. It’s a good program. If you have an Ultimaker 3D printer, I think actually it makes a lot of sense that you would use it because it’s really made for that 3D printer in terms of communication, integration and all the settings. That makes perfect sense. I’m speaking more to those that are using it with a non Ultimaker 3D printer, which I know a lot of people in the US are doing because Ultimaker has not been distributing in the US so easily until recently. I know they now have an office in the US and they are making a bigger effort to distribute in the US. That will change now overtime. Anyway, very impressed with it. Can’t obviously get into every little detail in a podcast like this. We’re coming up here on the end. It’s a good solid slicer. There you go. That’s my thoughts. If you use the Cura slicing software much more than I do or at all really and you have something you want to share about your experience, please do. Like said, I can’t cover everything here. If you have something to add, please submit a comment below. We’ll be happy to post that and share it with everybody else who reads this review. You can reach out to us on social media @3dStartPoint. We’ll be back tomorrow with another regular episode. Thanks for listening, everybody. This has been Tom on the WTFFF 3D printing podcast. I have tried three versions of Cura and all three crash constantly on a new workstation running 64gb of RAM. This software is a complete waste of time. In addition, I have tried to log into the forum to get help only to be warned that the connection is intercepted by hackers. What does it take to get this software to work?